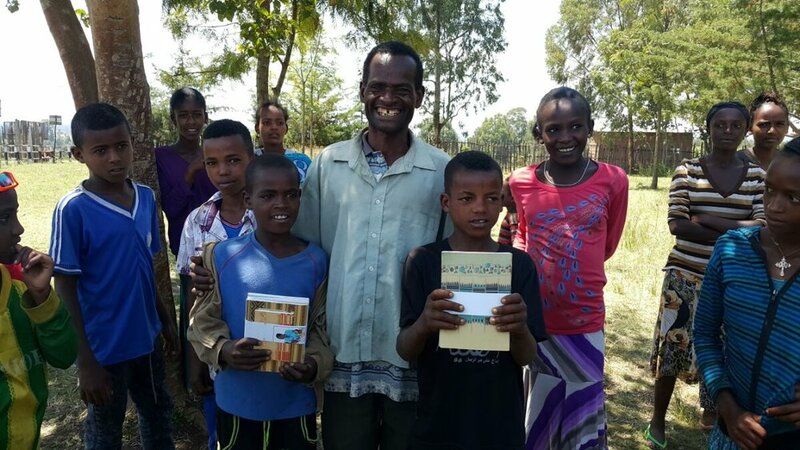 As the school year started in Ethiopia last Monday, the students at Offa School greeted the new year gripping special, personalized notebooks. 870 students each received 8 subject notebooks and an agenda, all free of charge as part of a partnership between Felek Notebooks and ET Learns. Thanks to the excitement of the project, 23 additional students registered for classes this year. Offa is a rural school 14 km from the woreda capital of Boditti. Before Offa was established, students had to travel long distances on foot over difficult roads to go to school. The roads were especially difficult during the rainy season due to mud, but also during the dry season because of high temperatures. Now the school serves nearly 1000 rural families, offering grades 1-8. The school employs 25 teachers, but still does not have electricity. Infrastructure, such as school supplies, lights, and books, is hard to come by. Last year ET Learns helped the school by providing 25 desks so that standing students could study. A local nonprofit, Wolaita Development Association, works closely with ET Learns and helped to coordinate the transportation of the notebooks. WHAT MAKES THE NOTEBOOKS UNIQUE? Each and every notebook of the over 7000 donated was written in Wolaitan. The Wolaita language is native to the Wolaita Zone, and is widely spoken in the regions around Offa school. Because it is a regional dialect, products written in the Wolaitan language, which students can easily understand, are very rare. For the first time, the students have a notebook in their language– the language of their home and heart. We believe education, like these notebooks, should be linked to the heart by language.